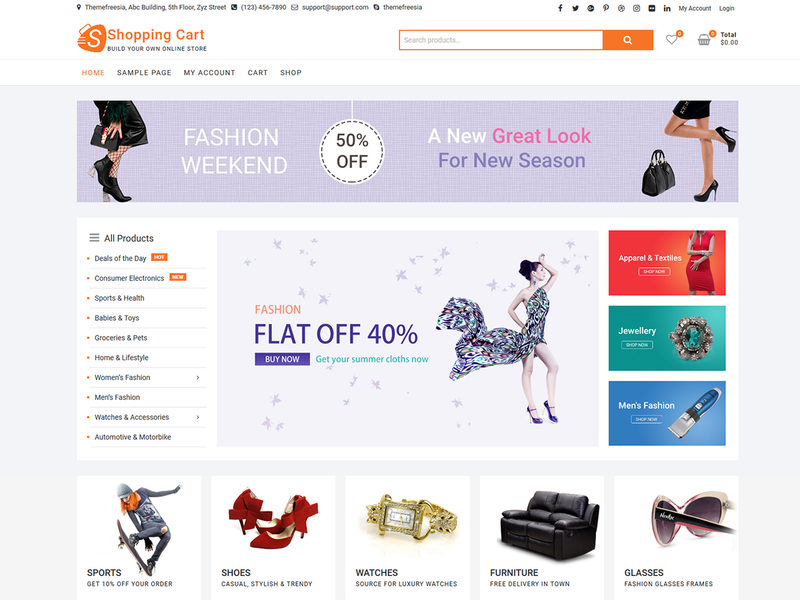 ShoppingCart is a beautiful theme especially build for Store, eCommerce, Shop and also fits for any kind of Shopping theme which contains all the feature you need to create a stunning website. The theme consists of well organized components so it’s easy to edit and customize everything to create a specific website for your needs. It is designed for Shopping but this is competent for every kind of site such as personal blog, ecommerce, portfolio etc. which is designed and developed by Theme Freesia. With a focus on Shopping sites, it features multiple sections on the front page as well as widgets, multiple navigation and social menus, a logo and more. This theme supports popular plugins like Breadcrumb NavXT, WP-PageNavi, Contact Form 7, Jetpack by WordPress.com, bbPress, wooCommerce and many more. It is 100% translation ready and you can easily customize with lots of options using Customizer. It consists contact us template, gallery template, Shopping Template, widgets and Sidebar. Get free support at https://tickets.themefreesia.com/ and View demo site at http://demo.themefreesia.com/shoppingcart.